Coming on the heels of a World Health Organization report supposedly rebuking President’s Trump’s warning about migrant-borne disease, we have this report: A migrant in New Mexico has been diagnosed with a flesh-eating virus. According to Border Patrol officials, the unidentified man whose home country was not disclosed will require extensive medical treatment. 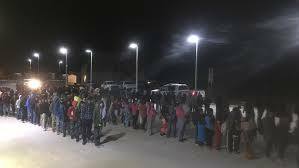 He was detained Thursday along with 300 other migrants in a remote desert area of New Mexico near the town of Lordsburg. Officials report that this area has seen a recent uptick in illegal migrant activity. Nearly 10,000 aliens have been detained at New Mexico’s three Border Patrol stations since October.